Guest Spot: Chicago! City of deep dish pizza, famous hot dogs, and pumpkin ice cream. I left town again. I KNOW! How can a NYC ice cream blogger keep leaving Manhattan in the middle of ice cream season?! Seriously. Last week I went to Chicago to perform my one-woman show in the Chicago Fringe. I feel like I'd abandoned you, and to assuage my guilt, I have another Guest Ice Cream Spot. Spotlight on: Chicago. 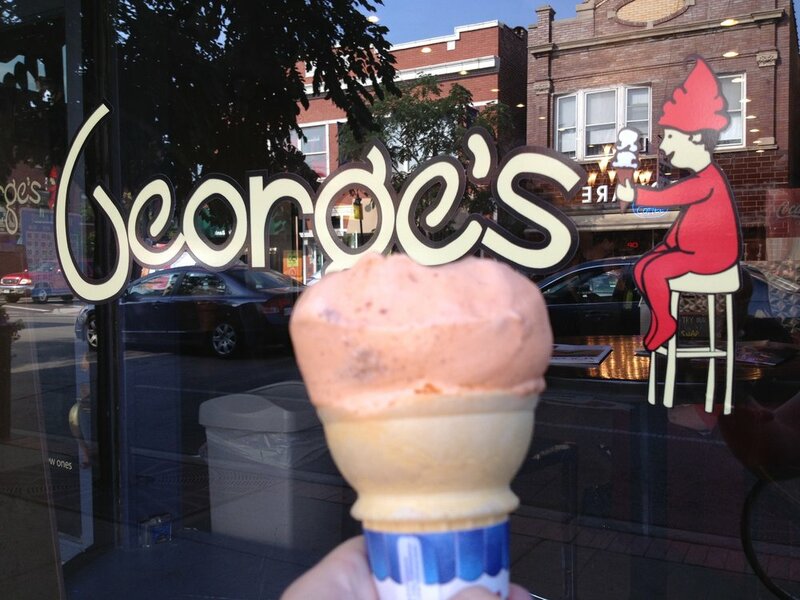 George's Ice Cream has only been on Clark St, in the adorable nabe of Andersonville, since 2009. Before that, the spot was called Sweet Occasions, a Wisconsin-based chocolate shop. In 2009 the Stotis family bought the place and named it after relative and town regular George Stotis, proprietor of neighboring Chicago Recycle Shop, who for 30 years delighted the residents with his philosophies on life and his thoughts on the stock market. According to their website, "George always wanted to open a coffee shop or restaurant in the neighborhood so he could meet friends and enjoy wonderful conversations." And voila, this ice cream shop was born. NOW. Let me be clear. I am not one of those "oooooh I can't wait for Fall" people. I don't do scarves and sweaters. Rather, I'm the one who will wear pastel skirts without tights into October, to extend my summer as long as possible (just in case me having a ice cream blog didn't already make that abundantly obvious). But. Have we talked about pumpkin ice cream? No? Next to Haagen Daaz Five Lemon Ice Cream, it is my absolute favorite ice cream flavor. The cinnamonness, the pumpkin-and-cream flavor, even the awful orange hue. . . it just hits all the right spots. And when you add bits of Gingersnap cookies into it, like George's did in their Snap-O-Lantern ice cream? Well. I don't care that it's only six days into September. Hand it over! And, while not exactly "local" - the ice cream is made by another party in Milwaukee, WI - it IS homemade, and I especially love that they serve both Vegan and Soy ice creams, for those offended by (or allergic to) actual milk. So truly, there's no reason not to go here, kids. If you're ever in this Chicago hood, trick-or-treat yourself (see what I did there?) to some pumpkin-y goodness. HAPPY NATIONAL ICE CREAM DAY! It's a wonderful day where we all have absolutely NO EXCUSE but to drop everything and go get some ice cream. Unfortunately, the Ice Creaming was out of her home digs and thus very, very far away from all of those wonderful ice cream places in NYC I still have to go see. So in honor of National Ice Cream Day (NICD), I'm breaking the rules and doing a little "guest blogging" of sorts, telling you about some awesome ice cream I got today at the beautiful Lake Winnipesaukee, NH. in flavors such as Dinosaur Crunch (blue-tinted vanilla ice cream with sprinkles! ), Unbaked (Cake flavor with cookie dough pieces) and the one I got, White Mt. Raspberry Truffle, a vanilla with raspberry swirls and white chocolate chips. Makes it 100% worth leaving the oppressive heat of New York City for.